The Nyangatom live on the west bank of the lower Omo River. Their territory extends all the way to the Kenyan and Sudanese borders and also to Sudan itself. 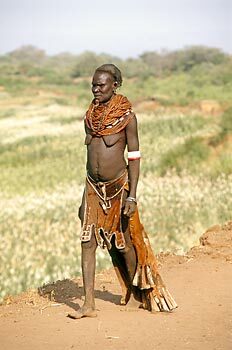 Like most tribes in the area they are – as they claim – surrounded only by enemies: to the south are the aggressive Turkana, to the north the Surma, and to the east across the river the Dassanech. 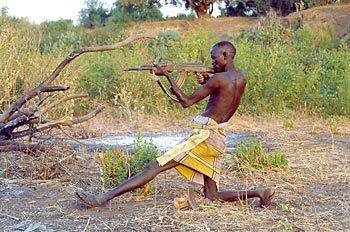 The Nyangatom were the first tribe in the Omo Valley to use automatic weapons (AK-47) which they obtained from Sudan just across the border. They use the machine guns to guard their precious cattle against thieves from neighbouring tribes and also to fight the tribal wars. Herds of cows are their most valuable property. Other tribes don't like the Nyangatom (mainly because they fear them) and call them pejoratively the Bume, which translates as ”stinking”. They themselves told us that Nyangatom means ”a yellow gun”, or also ”elephant eaters”, make your choice ... They are indeed fierce warriors which is supposedly demonstrated by their custom to scar their chest; one scar for each killed enemy. Heavy necklaces and long skirts from goat skins, which are richly decorated, are characteristic for the women. Necklaces were traditionally made from dry seeds, but these days they have been largely replaced with colourful glass beads coming from Kenya. The women also decorate themselves with ornamental scarification on their faces, chests, and bellies. Traditionally, until recently, the men were completely naked – just as the better known Surma and Mursi. But lately they adopted a large piece of cloth, which they usually wear tied across the shoulder or wrapped around their hips, or even shorts and shirts. Also famous are the unique deep wells which the Nyangatom people must dig in dry riverbeds during dry season in the villages far from the Omo river. Until recently there was no road whatsoever to the Nyangatom and the only way to get to them was to walk. But the long journey through the hot and dry landscape is virtually impossible in the dry season, because you wouldn't be able to carry enough water. Nevertheless, in 2009 a dust road was completed, which will eventually bring major changes to the tribe. us ..... and told off our guide for taking us so far on foot in such heat! With lots of big smiles we all said ”mata” (Nyangatom greeting) and continued our way. The Lower Omo Valleyis one of the world's most unique places. Many diverse tribes live here side by side in this relatively small area; each have their own customs and often speak very different languages. What they have in common is that they don't want to be invaded or changed by our modern world. They have always been fully self-sufficient. In the dry, hot climate they have developed a system of agriculture depending on the annual floods, which leave a narrow strip of fertile soil along the Omo river. Their traditional way of life is now seriously threatened by the construction of a giant dam and an associated hydro-power plant (Gibe III) on the upper Omo river. The environmental changes when it is completed will lead to the Omo tribes loosing their livelihood and becoming dependent on international aid, with the loss of their cultural identity inevitable. We wish to thank our Nyangatom friend Daniel who travelled all the way from Jinka to take us to his people and helped us to learn from them.